World 5000m Champion Hellen Obiri, has confirmed she will participate in next year’s World Indoor Championship, her first after a successful 2017 season. Obiri could miss Commonwealth Games in Australia which will be held a month after the Indoor Games in Birmingham. The 27-year old says she would love to focus more on her Diamond League performance next year especially with no major championship coming on after the Indoor Games. On her cards as well for the turn of the new season is a possible assault at the 5,000m World Record, held by Ethiopia’s Tirunesh Dibaba. "Next year, my first target is the World Indoor Games and it is something I really love participating in. I have not yet made a decision on whether or not I will go for the Commonwealth Games because my big target is on the Diamond League,” Obiri said on Thursday. She will be looking out for her second indoor title in the 3,000m, having won her first title in Turkey in 2012. Two years later, she won silver over the same distance in Sopot, Russia. After a stellar 2017 which has seen her nominated for the IAAF female athlete of the year award, Obiri has returned to training at her base in Ngong after a short post-season break. Apart from her World Title, Diamond League crown and nomination to be crowned as the world’s best female athlete of 2017, Obiri also managed to be elected into the National Olympic Committee of Kenya as the athletes’ representative. “It has been a great year for me and I am really thankful. All these results have been down to good planning. We sat down with the coach at the beginning of the season and decided what our targets were, something that made it easier to work out each competition well,” Obiri added. “I would want to replicate this next season as well. I know it is tough and there is so much expectation, but I am ready to do my best,” she further noted. 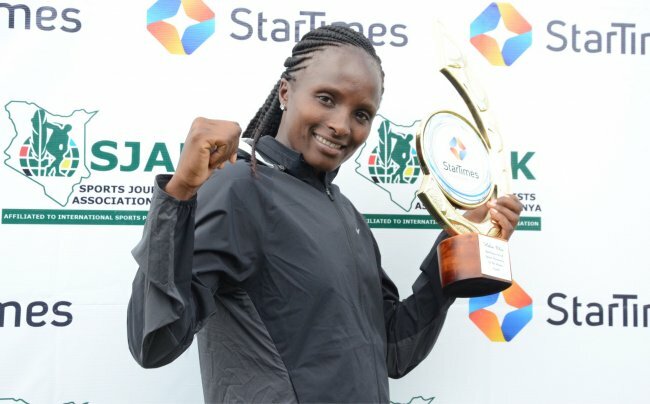 Her success received yet another feather on Thursday when she was rewarded by the Sports Journalists Association of Kenya, SJAK, in conjunction as the best sportsperson for August. She beat competition from fellow athletes Faith Kipyegon (1500m), Geoffrey Kirui (Marathon) and Conseslus Kipruto (3,000m steeplechase) all who won gold medals in London during the World Championships. Youngster Dianah Tembesi, Wiyeta Girls High School football goalkeeper was also among the shortlisted. Obiri’s scintillating run that lit up the Olympic Stadium in London to beat Almaz Ayana to the gold medal at the World Championships proved the masterstroke to her getting the award. "I actually haven’t seen athletes awarded before. Mostly it has been footballers. I am so grateful for the sponsors and SJAK for this award and hopefully, it signals better things to come in Monaco in November,” Obiri said after landing her award. She also received Sh100,000 in cash, a plaque and a 40-inch Samsung Television. Obiri has also called on Kenyans to continue voting for her and compatriot Elijah Manang’oi in the online IAAF social media pages as the official voting period ends on Sunday. The online votes count for 25 percent of the final tally. Obiri has been shortlisted for the IAAF world athlete of year for 2017.